Technology and Science Magazine. 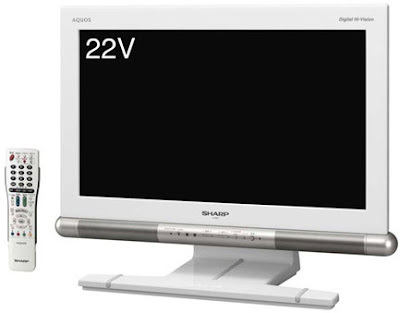 Sharp introduced a completely new line of LCDs designed equally for computers and TV watching. The AQUOS P series is designed as much to sit on a desk as in a living room and is one of the first HDTV lineups to offer full 1080p video at small sizes; the 22-, 26-, and 32-inch sets all display up to 1920x1080 using either DVI, VGA, or one of the two available HDMI inputs. An integrated digital TV tuner and two 5-watt speakers allow the sets to operate independently of any outside device but can be used with a picture-in-picture mode to let users run a computer while keeping track of a TV show. While input and resolution remain the same for each LCD, contrast ratios vary between 1,200:1 for the 22-inch display and 2,000:1 for the top 32-inch model. Sharp is initially releasing the AQUOS P in Japan with the country's proprietary D5 video input as well as support for HDCP-encrypted videos through DVI and HDMI. Pricing will be open on the market when the displays ship on November 22nd. Releases outside of Japan are unknown but would require changing or removing both the D5 input and the TV standards supported by the built-in tuner. Technology and Science Magazine. Iiyama has announced a new lineup of touch sensitive monitors for desktop computers. 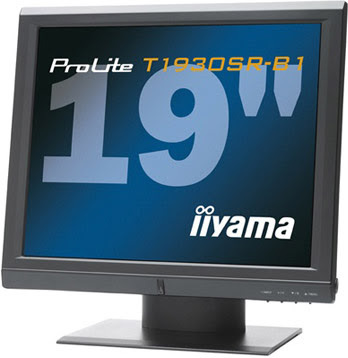 The offerings consist of the 15" ProLite T1530SR, the T1730SR, and the T1930SR, all of which connect either through VGA or DVI, and support USB and RS-232 for the touchscreen interface. The new ProLite screens use a 4:3 aspect ratio and come in either a black or white bezel. The 15-inch model supports a typical 1024x768, featuring a 16ms response time, while the 17- and 19-inch versions are rated at 5ms response, with a resolution of 1280x1024. Contrast ratio for the displays is measured at 500:1 for the 15-inch, and 800:1 for the larger models. The touch-LCDs are advertised as being compatible with both Macintosh and Windows-based systems, an offer a full set of on-screen controls. Iiyama offers the Extensive Touch Utilities to allow for 4-point calibration of the touch area with either nine or 25 point linearization, and the displays can be viewed in either landscape or portrait modes. Prices for the displays sit at £330 ($700US) for the 15-inch model, £350 ($750US) for the 17-inch, and £400 ($850US) for the 19-inch version. Technology and Science Magazine. 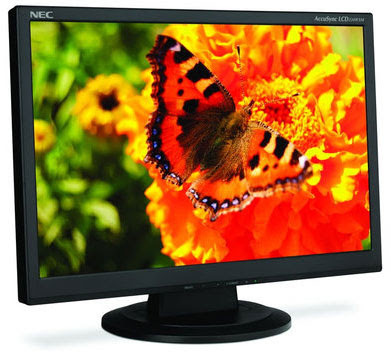 NEC announced the addition of three new wide-screen desktop displays to the popular AccuSync line, targeted to small- to medium-sized businesses, direct marketers, home office workers, system builders, and retail channels. The 19-inch ASLCD194WXM and the 22-inch ASLCD224WXM displays replace the previous generation wide products, while the 17-inch ASLCD174WXM is a new addition to this category. Each is a multimedia product, and the displays are enhanced with a new, sleek, thin design. All models are touch-integration compatible. The three displays feature NEC’s exclusive ECO Mode, an easily selectable, power-reducing setting, which reduces brightness and cuts energy costs by 30 percent. The models will be available in March 2008 with an estimated street price of $209.99 for the ASLCD174WXM, $229.99 for the ASLCD194WXM, and $329.99 for the ASLCD224WXM. Technology and Science Magazine. By Martin Lemieux. The way we do business is changing rapidly. From VOIP, video conferencing, email support, telephone answering services, and the almighty internet. As a business owner we are faced with hundreds of decisions our parents and grandparents never had to contend with. Some of you keep hearing from other business associates that internet marketing is the greatest method of increasing business and building a foundation for customer support. The only problem is, you've just learned how to send emails to people! Never mind learning about SEO, web design strategies, content analysis, pay per click, ROI, etc! Do you hire an SEO company or do you learn yourself? Investing time into your company is what we business owners do best but, in many cases, when it comes to learning new methods we quickly open our wallets to anyone out there who seems like the right person to help with your situation. This is the worst possible decision you can make. Diving into the internet marketing community with your wallet open will result in a disaster if you aren't properly trained on how to spend your money wisely. The key is not to hire an SEO (Search Engine Optimization) company to take your money and promote your business behind your back. Try finding someone who offers you their "training services" in order to train yourself or someone within your organization to learn more about what is required online, how much effort it entails, and what pitfalls to avoid. As a business owner, if you blindly search online and pick a company, you have no idea what you could be getting yourself into. There are no secrets to promoting your business online, only a lot of hard work. That being said, anyone with a computer can easily learn how to get their company high search engine rankings. Search engines don't look to see whether or not you're running a scam. No, they are concentrated on delivering relevant results for your search terms. In the old days (and still practiced today), business owners would devise their own marketing plan through print media, business cards, postcards, flyers, brochures, newspapers, magazines, TV ads, and radio ads. By doing this, the company could track their results by trial and error and really find out what truly works for their industry. Old fashioned marketing is a simple trial and error process. So is the internet. Unfortunately, all too many business owners don't have a clue how to start their own internet marketing process and they fail to even put their foot in the water. Instead, many business owners simply hire anyone they can find that seems reputable and then turn a blind eye and say; "Here's my budget, you are the professional, you tell me what to do". This is simply preposterous. You've worked so hard to get to where you are now by learning and adapting and as soon as it comes to marketing your business online, you simply shut down. I hope that this article has awoken some of you. Don't be afraid to dive into the internet's vast realm of marketing potential. So what if you fail the first time around. When we started out, we had no idea what we were doing, 3 years later our website ranks higher than many other internet marketing companies world wide. A concept I call "T.I.M.E." So here you are 10 months out of the gate and your website may still be "locked in the Google sandbox" ( Search for "Google Sandbox" in Google for an explanation). Your link popularity is just starting to grow a little bit. Hopefully you haven't tried to link to everyone you can find and are actually linking to companies that are directly related to your business. Your PPC campaign is doing good. People are finally starting to come through Yahoo & MSN search results. You can sometimes find your company in the 200th spot within search results in Google and you are now wondering why this is taking so long. Welcome to the world of marketing your company on the internet!!! This timeline representation from above is just something to show you how "T.I.M.E." is the key of success on the internet and all we are required to do is keep plugging away and keep learning more every chance we get. For most people who simply open up their wallets, they would have learned nothing in those 10 months and for everyone else starting an internet marketing campaign, those who didn't simply just open their wallets, their websites are probably 10 times further than yours! Learn more about how to increase your marketing campaign on the internet. If you have to, hire someone in-house who can learn for you and give you updates on everything. If you truly need to hire an SEO company make sure it's for the right reasons like "starting and finishing a marketing campaign with you learning in the process", or "enhancing a campaign that is already in place", or "to revise your website’s conversion rate" or "create a impactful key word optimization campaign", etc. Take your time and use "T.I.M.E." to increase your business slowly but effectively on the internet. The handset is both very camera- and data-focused. A 5-megapixel camera is accompanied by a high-power LED flash as well as by face detection and image stabilization - all features normally reserved for some of the better dedicated cameras, the company says. Transfers are quick with 3G Internet access over HSDPA up to 7.2Mbps downstream; the phone supports North America with quad-band calling over GSM, though whether it also supports 3G in the Western region is unknown. The phone makes heavy use of Google features and supports built-in Gmail and search functions, including a dedicated button at the top level of the interface. The 12.8mm (0.5in) thick phone is said to be music-savvy with AAC, FM radio, MP3, and WMA support, including protected WMA music stores. Bang & Olufsen's ICEpower audio enhancement technology is also onboard the Soul, which should be available first in Europe by April but is likely to see service in the US through AT&T if left in its current form. Technology and Science Magazine. Samsung has presented the F400 dual-slide with Bang & Olufsen's sound technology. There's a lot more to the F400 than its musical capabilities, but as they set the handset apart then it will be worth looking at them first. One immediately obvious feature is the large stereo speaker that slides up from the top of the handset, in a similar manner to the Samsung Serenata and the Samsung i450. This means that the SGH-F400 should be loud enough to actually hear your music tracks or the FM radio properly. The sound system uses Bang & Olufsen's ICEpower amplification system, it also comes with music recognition, a comprehensive audio library function, Samsung's Digital Natural Sound Engine and other music related goodies. The SGH-F400 takes a standard 3.5mm headphone plug, and it also comes with an FM radio with RDS. Samsung SGH-F400 As we said, there's more to the Samsung F400 than just music. This is an HSDPA capable 3.5G device with a maximum download speed of 3.6 Mbps. The F400 also supports GPRS and EDGE data, plus 2100 MHz UMTS and tri-band GSM. 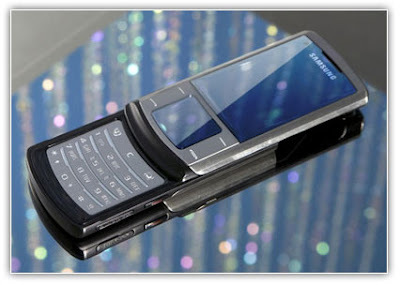 From this, we can tell that the Samsung F400 is aimed primarily at the European market. On the back of the Samsung F300 is a 3 megapixel CMOS camera. From the press photographs we can see that it does appear to have a flash, but we don't know if the camera is an autofocus or fixed-focus unit. SGH-F400 B&O labelling The 2.2 inch 240 x 320 pixel TFT display is semi-concealed behind the F400's glossy surface. 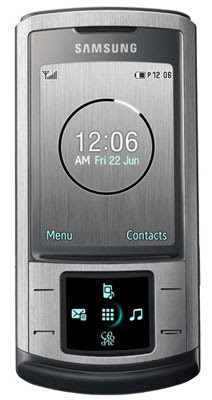 Overall, this is an attractive looking handset, but it isn't terribly distinctive. The B&O labelling on the SGH-F400 is very discrete. 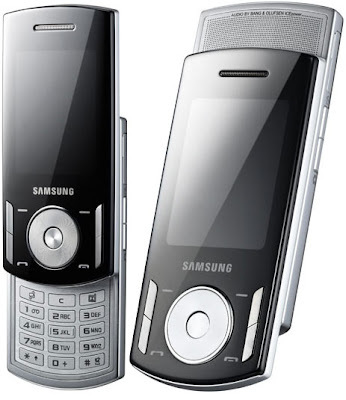 The Samsung SGH-F400 measures 103 x 48 x 17mm, and it supports USB 2.0 and Bluetooth 2.0. There's a microSD slot to the left of the keypad, although Samsung have not stated the maximum capacity that the F400 can take. We don't know the exact launch date of the Samsung F400, but we do know that Nordic countries are expecting the phone in August of this year. It is possible that some markets may have the F400 earlier than that. Technology and Science Magazine. Verizon and Nokia teamed up and announced the Nokia 6205 The Dark Knight edition mobile phone, celebrating the upcoming July 18 theatrical release of “The Dark Knight”. it is preloaded with Dark Knight’s wallpapers, voice tones, animated screensavers inspired by the film, and a full movie trailer. This clamshell comes with touch-sensitive external music keys, making it easier to access tracks purchased from Verizon Wireless’ V CAST Music service. The Nokia 6205 The Dark Knight edition will be available online for $69.99 after a $50 online instant rebate with a new two-year customer agreement. 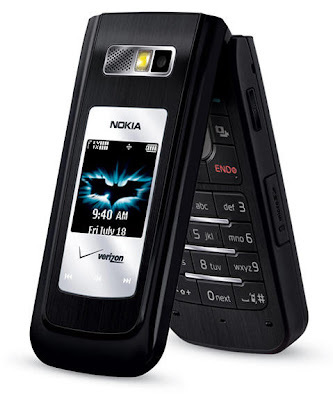 Following the premiere release of The Dark Knight edition, the standard edition of the Nokia 6205 phone - containing all of the same features and a striking metallic blue and silver color scheme - will be available both online and at Verizon Wireless Communications Stores next month. Which ones can be money making hobbies? A friend made a life-sized cow out of plywood once. He painted it, put it in the yard, and people started asing if he would sell it. He soon had a waiting list of customers for his plywood cows. With a profit of about fifty dollars each, he wasn't getting rich, but isn't making money with your hobby more fun than a job? The first approach is obvious: Look for ways to make money with your existing hobby or hobbies. What do you produce that other people might want? Do you collect dolls? You might produce a newsletter for other doll collectors, or buy and sell doll furniture. The second approach is to think of all the hobbies you might take up that can generate a second income for you. When I found that I really enjoyed making walking sticks as a hobby, I sold more than a thousand dollars worth one summer. There are probably things you would enjoy doing that can make some money. Get creative in your thinking. Look at the list of activities or hobbies below, and see if you can think of a way they can be used to make money. Do you like to travel? You might become a tour guide, or write articles for magazines. In the past, you could argue that not all hobbies can be money making hobbies. This is no longer true. If you go to my sites, you'll notice the ads. I just copy and paste some code (no selling involved), and make a little bit everytime you click on one. In a matter of days, with almost no money, you can have a website up where you write about your favorite hobby, and collect for the advertising clicks. Article Technology and Science Magazine. If you are reading this, chances are that you need to find a new way to make money online. There is good news. Every single topic can be turned into money when you know what to do and how to do it; but how to get new ideas? It’s as easy as grabbing a pen and paper. *Note that this varies greatly from person to person! The advantage of using this method is that those words you choose are related to you somehow. This means that you have some experience with them; and since you can make money out of mostly everything, this will help you have ideas that you never thought about. Out of these new keywords, you might choose to make a website that sells new songs; or make a new site in which you have everything (lyrics, authors, famous people, forums, and new songs). You can focus on selling CDs from that website with an online store. You must be creative by getting your ideas together and joining them to make a new idea altogether. If you focus on anything else; you will never stand out. In this article, I focused on making something very original; since, with practice, you will be able to have so many ideas that your competition will keep wondering “Why didn’t I think of that before? Article Technology and Science Magazine. You've thought about it for awhile now. There's a good chance you've rationalized it and said, "Next year I'll get my own business started." Guess what? It's next year, and there's no better time than the present to get your home business started. Is there a secret to starting and making money with a home business? What about making lots of money? Are there just a few people out there that can be successful? Or can anyone make it happen? In my research of successful home-based business owners, I've found two essential ingredients to success: having a good attitude and lots of determination. Call me crazy, but we can all have these and it isn't going to cost us a dime. It's easy to tell yourself that you could never start, let alone run a home business because of this or that reason. It's easy to rationalize "Well those people who are super successful, they probably had a bunch of money to start their business with and they probably knew all the right people." Well, that's usually not the case. Any self-employed person will tell you how hard it really was to make their business a success. It always comes down to lots of hard work! Many years ago I was teaching my youngest daughter to ride her bike without training wheels. She was riding on the side of the road, and was very nervous about running into the curb. Every time she would start to peddle, she'd immediately look at the curb, and sure enough, she'd head straight for it. I explained to her, "Look at where you want to go, not where you don't want to go." It's funny how when you look straight ahead, the bike goes straight ahead, but when you focus on where you DON'T want to go, you end up there. The mind is a wonderful machine and it can be our best friend. If you constantly tell yourself that you can be a success, you can make money doing what you love; your mind will find a way to make it happen. A quote by Edward Vernon Rickenbacker says, "I believe that if you think about disaster you will get it. Brood about death and you hasten your demise. Think positively and masterfully with confidence and faith, and life becomes more secure, more fraught with action, richer in achievement and experience." No matter where you are coming from, it's your attitude and determination that will ultimately decide the fate of your home business. If you want to work-at-home badly enough, then you need tell yourself on a daily basis that you will find a way to make it happen, and you will be a success at it. Do this and your business will not only get started, but is will also grow and thrive. With a positive attitude and determination you can move mountains!